This integration has been built by the Outreach engineering team and is fully supported. This integration has not been built by the Outreach engineering team but is fully supported by Outreach. This integration has not been built by the Outreach engineering team and is vendor-supported. Hang tight! This integration is not yet generally available. Outreach's intelligent bi-directional sync ensures complete fidelity between data in both systems. All activities executed in Outreach — calls, emails, etc — are automatically logged in Salesforce and conflict resolution detects and resolves conflicts to keep data pristine. It works in Salesforce Aloha and Lightning editions. Specify which fields on an object should receive updates, both from Outreach to Salesforce and from Salesforce to Outreach. Outreach automatically detects when leads are converted to contacts, dynamically remaps to the contact, and pulls data in to stay up to date. When a prospect is mapped to a contact, Outreach will ensure the account is pulled in and the prospect is automatically assigned to it. Map users to the right role in the role hierarchy just once – updates take care of themselves. Outreach performs real-time version control in data transfer to ensure that if both records have changed, the more recent update will survive. The power of Outreach lives in Salesforce. Create a report, import a single lead/contact, and click to engage (email, sequence, call) without interrupting your workflow. 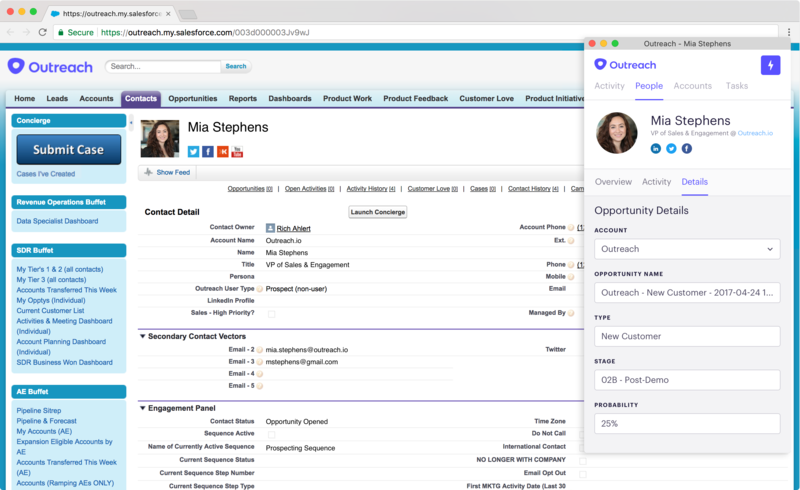 See Opportunities data in Outreach, view pipeline by deal stage, and sequence prospects from the Opportunity page.